In previous Code cycles, when conducting residential electrical training in a typically opulent hotel meeting space, I would ask, “How many receptacle outlets does the Code require us to supply for this splendid meeting room of this hotel that we are meeting in today?” The answer, of course, was “Zero!” I would ask this question to these residential training attendees to demonstrate that the National Electrical Code (NEC) contains rules pertaining to residential construction that did not, or do not, apply to commercial construction. Beginning with the 2017 NEC, however, the answer to that question could be a moot point as the answer could be the same for both the dwelling unit and the commercial hotel meeting facility. A new 210.71 titled, Meeting Rooms was introduced into Chapter 2 of the 2017 NEC requiring a minimum number of receptacle outlets for certain size non-dwelling unit meeting rooms. In some situations, this will require a certain number of receptacles to be provided and possibly spaced apart similar to a dwelling unit and the wall spacing rules of 210.52(A)(1) through (A)(4). Larger meeting rooms with a floor area greater than 93 m2 (1000 ft2) is the cutoff point for required receptacle outlets in these convention-type facilities. Without this new obligation, there was previously no Code rule to provide receptacle outlets in meeting rooms of commercial or non-dwelling occupancies. The fact that 125-volt, 15- or 20-ampere receptacle outlets were installed in meeting rooms at all was due in part to the building owner and designer recognizing the need for access to electrical power for a multitude of different types of portable equipment. From a design standpoint, you rarely encounter a meeting room with no receptacle outlets, but before the 2017 NEC, a code-compliant project could have resulted in a space such as a hotel meeting room with no receptacle outlets whatsoever. This proposal was accepted at the proposal stage by Code Making Panel (CMP) 2 with an affirmative vote of 10 to 2. During the 2011 NEC Report on Comments (ROC) stage, two comments were submitted encouraging CMP-2 to continue to accept this new proposed floor receptacle requirement. Six comments were submitted seeking CMP-2 to reverse their previous stance and to reject or remove this newly proposed floor receptacle requirement for meeting rooms (see 2011 NEC Report on Comments, ROCs 2-147 through 2-152 and ROCs 2-154 and 2-155). 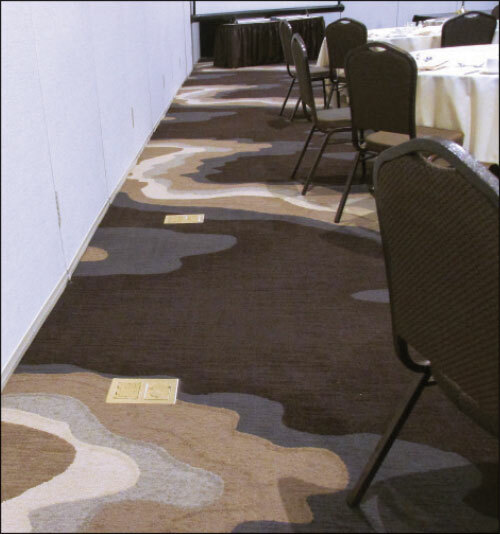 Photo 2: Daisy-chained plug strips and relocatable power taps are in high demand in most meeting facilities. During the 2014 NEC revision cycle, this topic was revisited. A proposal was submitted once again by NEMA seeking a certain number of wall and floor receptacles in meeting rooms (see 2014 NEC Report on Proposals, ROP 2-198a). 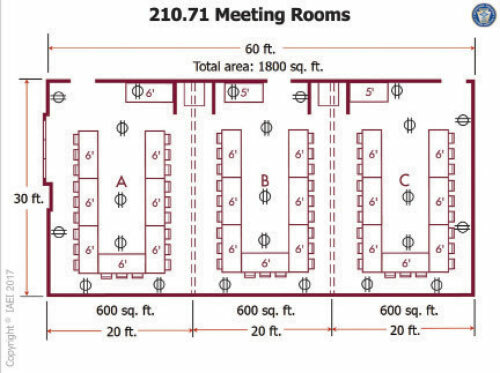 This proposal was submitted for a new location at 210.71 titled “Meeting Rooms.” This 2014 NEC’s proposed new text was similar to what is now required in the 2017 NEC, but the limitation on the size of the meeting room was proposed at 70 m2 (760 ft2) rather than 93 m2 (1000 ft2) as it is now. The proposed 2014 text was also seeking receptacles to be installed such that no point measured horizontally along the floor line of any fixed wall would not be more than 1.2 m (4 ft) from a receptacle. This brings us to the 2017 NEC where First Revision (FR) 7517 and Second Revision (SR) 329 resulted in the requirements we currently have at 210.71 for meeting room receptacles. In creating FR 7517, CMP-2 made this committee statement, “The addition of this new section addresses the inherent (NFPA 101, Life Safety Code-2012) concerns relating to inadequate access to electrical power in meeting rooms. Without this change, a design that complies with the minimum requirements could result in a meeting room with no receptacle outlets. Since it would be virtually impossible to not violate portions of the NEC® concerned with the use of extension cords with the current minimum requirements, it follows that there is a need for a minimum number of receptacle outlets in these rooms. Receptacle outlets are needed to provide power along wall lines for displays, coffee pots, heating of catered food, and other electrical/electronic equipment. This need will be met by receptacle outlets installed in fixed walls, and floor receptacles installed near moveable partitions. 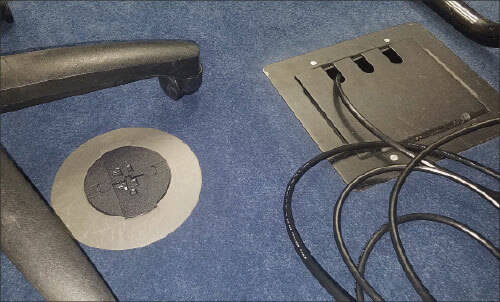 In addition, a floor receptacle outlet will be located away from walls to minimize the need for extension cords and multi-outlet devices when employing projectors and the like.” This first revision was initiated once again by a NEMA public input (see 2017 Public Input 2872). The requirements of 210.71 were revised to what we see in the 2017 NEC by SR 329 based on four public inputs (see 2017 Public Comments 762, 1188, 1761 and 828). CMP-2 released this committee statement with SR 329: “Changes were made to 210.71(A) for clarity. 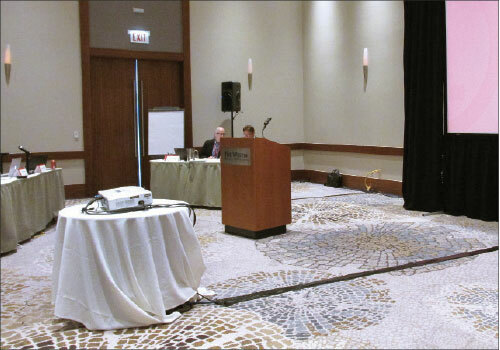 The square footage was increased to accommodate a reasonable sized meeting room without including convention halls. These requirements apply to meeting rooms not more than 1000 ft2 in area. Informational Note No. 2 was deleted and replaced with a new Informational Note to give examples of rooms that are not intended to be meeting rooms. 2017 NEC – What is Now Required? The new provisions of 210.71 now calls for any meeting room that is not larger than 93 m2 (1000 ft2) to have outlets for nonlocking-type, 125-volt, 15- or 20-ampere receptacles. This provision would apply to “other than dwelling units.” An informational note to this new section indicates that the meeting rooms in question are “typically designed or intended for the gathering of seated occupants for such purposes as conferences, deliberations, or similar purposes, where portable electronic equipment such as computers, projectors, or similar equipment is likely to be used.” Another informational note gives the user of the Code some examples of rooms or spaces that are NOT considered meeting rooms for the purpose of required receptacle outlets. This would include such spaces as auditoriums, schoolrooms, and coffee shops. As noted earlier in some of the previous substantiations for this requirement, there is nothing “magical” about the 93 m2 (1000 ft2) threshold. Several dimensions were discussed by CMP-2 in the comment stage. The square footage of 93 m2 (1000 ft2) was settled upon by CMP-2 “to accommodate a reasonable sized meeting room without including convention halls.” This 93 m2 (1000 ft2) threshold could possibly move to something like 111 m2 (1200 ft2) or 74 m2 (800 ft2) or some other measurement depending on the public inputs received by CMP-2 for the 2020 NEC revision cycle. 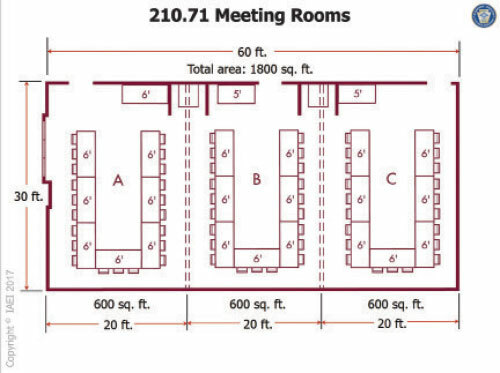 Where the room or space is provided with movable partition(s), each room or space proportions are to be determined with any and all partitions in place that would result in the “smallest size meeting room.” For example, a meeting facility at a hotel consists of an area with a total square footage of 167 m2 (1800 ft2). However, the space contains two movable partitions that (when in place) can divide the total space into three equal spaces of 56 m2 (600 ft2) respectively (see Figure 1). To determine the total number of receptacle outlets located in fixed walls, the provisions for wall receptacles at dwelling units found at 210.52(A)(1) through (A)(4) must be incorporated. Part of these dwelling unit receptacle spacing requirements is the “no point measured horizontally along the floor line of any wall space is more than 1.8 m (6 ft) from a receptacle outlet” provisions that we are all acquainted with if you have done any residential electrical installations at all. Depending on the size of the meeting room, a certain number of floor receptacles will be required to be installed to meet the needs of the present and future meeting room occupants. A meeting room that is at least 3.7 m (12 ft) wide and that has a floor area of at least 20 m2 (215 ft2) must be provided with at least one floor receptacle outlet for each 20 m2 (215 ft2) or major portion of floor space. These floor receptacles must be located not less than 1.8 m (6 ft) away from any fixed wall. A meeting room of 56 m2 (600 ft2) would demand a minimum of three floor receptacles (600 ÷ 215 = 2.79) (see Figures 1 and 2). These required floor receptacle outlet(s), located away from fixed walls, will minimize the need for extension cords and multi-outlet devices to facilitate the likes of a projector in the middle of the meeting room. 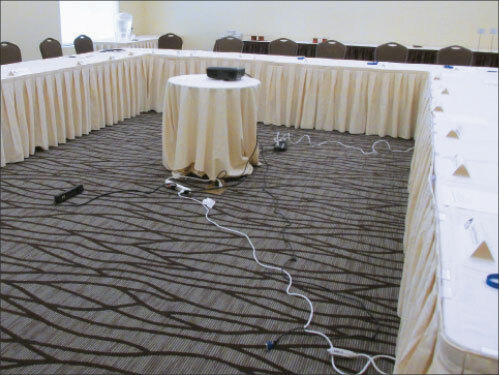 We have all witnessed the current practice of providing an extension cord, usually plugged into a wall receptacle outlet and taped to the carpet to provide power to such things as laptops, phone chargers, and projectors that are used in the middle of a meeting room at tabletops. An informational note gives users of the Code direction to 314.27(B), which generally requires the use of boxes listed specifically for floor applications to be used for receptacles located in the floor. Prior to the inclusion of meeting room receptacles in the 2017 NEC, any receptacle outlet found in a typical hotel meeting space was there solely at the pleasure and good graces of the designer or building owner. These receptacles were there by choice, not by a Code-mandated rule. Even before the 2017 NEC and the new requirements for a certain number of meeting room receptacles, 210.50(B) required a receptacle outlet is to be installed wherever flexible cords with attachment plugs are used. It is virtually impossible to use most typical meeting rooms in the fashion that they are normally used and not resort to some form of a flexible cords with an attachment plug. This fact only points toward the need for some minimum requirement for receptacle outlets in these gathering places. Receptacle outlets are needed in meeting rooms to provide electrical power for such things as booth displays, coffee pots, heating of catered food, and other electrical/electronic equipment such as laptop computers, phone chargers, and projectors. There is also a great need to provide electrical power at moveable partitions in the form of floor receptacle outlets to help prevent the use of portable extension cords in these areas. For the current edition of the Code, the placement of meeting room receptacle outlets may be best left to the designer, but the decision on whether or not to provide receptacle outlets is a safety issue and belongs in the NEC. These new meeting room provisions do allow the placement of receptacle outlets at the discretion of the designer or building owner while also including minimum provisions for receptacle outlets in meeting rooms in the same way as 210.60 does for guest rooms or guest suites in hotels, motels, sleeping rooms in dormitories, and similar occupancies. In the future, leave your duct tape and extension cords at home and enjoy your business meeting!